No, I'm not talking about digitizing card games into tablet apps. That app revolution is already in full steam; it has certainly revolutionized how card games can be designed and sold, but that's already yesterday's news, isn't it? 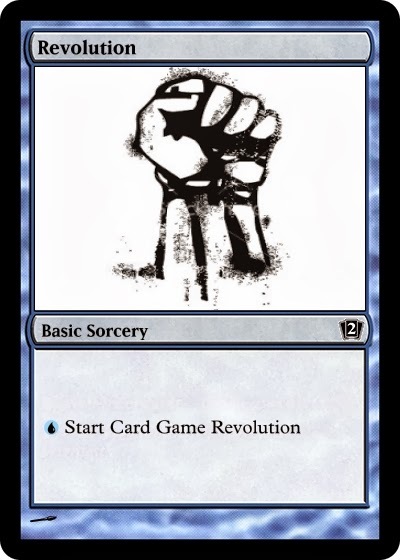 I'm blogging about a different revolution that has just begun in printed card games. I know long form reading and the internet mix like oil and water... so if you only want the meat of the matter, skip to the revolutionary part and decide for yourself if the blog post title is portentous or pretentious. Business is a like a game. On your turn, you contemplate dozens, maybe hundreds of possible moves and their projected outcomes; you identify what you believe to be the best one; and then you play it. Likewise, it is common to come up with 10x or 100x more ideas than your business has the resources to implement. Culling those ideas down to just the few opportunities that you choose to pursue is a core strategic competency for any business team. Apple is lauded for its discipline to focus on just a few products. For publishers, these decisions frequently center around title selection: how many titles to publish, and which ones? For OneBookShelf, that new idea curation process revolves around which technical features to implement, which marketplaces to open, and what new services to offer. So why did we decide last year to start the DriveThruCards marketplace and integrate short-run card printing services with our marketplaces? What made that the best move for us in the game? The business idea of "first-mover advantage" is more commonly discussed than that of second-mover advantage or being a fast-follower. Despite the many advantages that accrue to first-movers into a new market segment (such as establishing a market position for your brand, as discussed in my prior post), I personally prefer to be a second-mover into many business opportunities. For example, when starting DriveThruRPG, we were a second-mover behind James Mathe, who had already started RPGNow. Being a second-mover means that someone else has done the risk assessment for you. Of a dozen business teams exploring new business ideas, if one business is taking off while the other eleven are failing, then joining the new market with the one that is succeeding is a way of mitigating your risk as a start-up. Think of it like this: If the first marine on this part of the coast survived long enough to form a beachhead, then it's more likely that you'll survive there, too, as the second marine to land. Most start-ups burn out for lack of resources before they can find a viable business model. If a start-up has already found a viable business, then it has already identified an idea and a market that has merit. And it's usually not enough, as a second-mover, to just copy what the first-mover has done. The first-mover is already up and running; they're learning from their mistakes, establishing their brand and market position, and forming customer relationships. Chances are, the first mouse isn't dead; it's still struggling to get at that cheese. As a second-mover, if you merely intend to be a "me-too," then you're not likely to get very far unless the first-mover is failing to execute well. You have to offer something the first-mover doesn't offer. You should be able to improve the product or service in some fundamental way. Otherwise, you're not really adding much to the world. Worse, iterating on someone else's business model degrades into the morally darker zone of merely copying someone else's business. All may be fair in love and war, but how do you feel about yourself at the end of the day? What Does This Have to Do with Cards? Reset now to last year, when three things were already happening that would inform our business plan. First, there were several companies offering short-run card printing; some of them, like the Game Crafter, were making a lot of their publisher clients happy with great service. Second, OneBookShelf had already implemented our print-on-demand book service on our marketplaces, and every month more and more publishers were finding it useful. Third, at game industry trade shows, Sean Lashgiri and Christian Moore were showing off cards printed by On Demand Technologies (ODT), and the cards looked great. Everything looked reasonably straightforward for us to partner with ODT as our print partner, re-purpose our existing code for processing on-demand books to also handle on-demand cards, and roll out card printing services to publishers. It wasn't sufficient, however, that the idea merely be doable, or even that it be a good idea. Like many businesses, we had 100 good ideas to choose from. So what made this one our best next move in the game? What could we offer that was different or better, that wasn't just a me-too service that really added little to card gaming? ODT offers many advantages for printing cards. For one, they use an ink-base HP Indigo press instead of a toner-based press. For DriveThruCards, we decided early on to offer premium, black core card stocks. For a variety of reasons, we felt that we could improve the quality of short-run cards and produce a product that could be seamlessly shuffled into decks of existing card games printed by offset printers. On-demand cards could be professional retail quality, not just prototype quality. DriveThruCards is also able to offer more attractive costs to print cards. Being able to offer improved quality at a lower price is always a great reason to enter the market. Nevertheless, even these weren't the factors that convinced us to offer card printing services and a card marketplace. The deciding factor was that we could create tools for card game designers that went deep into how card games can be designed and published: We could use on-demand printing technology to unchain designers from prior design restrictions and unlock a wide array of new capabilities. Some restrictions imposed by current models of manufacturing and distribution become so ingrained that we become inured to them and they effectively become invisible to us. For example, card games - even short, on-demand print runs - have traditionally been produced on press sheets; since you can fit 18 or 20 or 90 cards on a press sheet, the economies of manufacturing have dictated that a card game ought to define its card count around the press sheet size. With our POD card service, we have freed card game designers from that artificial design limitation. There is no longer a need for a card game to have some multiple of 18, 20, or 90 cards in its deck based on how many cards fit on a press sheet. When you're playtesting your card game design and you realize the game could do without these 3 cards, but it could use another 7 cards added - and maybe some turn reference cards for each player - you have the flexibility to slot cards in and out of your game until the moment you want to publish it. If your game ends up with 89 cards, or some other prime number, that's fine. And after publishing it, if you later need to change the card count up or down, whether by a few or a lot, that's fine too. "That's cool," you say, "but Steve, that's hardly going to revolutionize card game design. What else ya got?" Here are some examples of what will be possible with the tools we're coding right now. I'll start with the most prosaic and escalate to the more revolutionary. 1. Offer your deck-building or customizable card game as a collection of single card products, selling as singles at prices you determine. Customers get a web GUI to build their own deck from the singles, and then have that specific deck printed and shipped to them. Next, think iTunes playlists - the community for your game can share their deck ideas with other customers, who can browse for deck builds they want to purchase and try out. Working with you and your game layout and design, we create a customer-facing web GUI page that allows customers to create their own cards for your game. It's something like this Magic card creator page, except the customer can then order the cards they create in print (optionally, after you review them for content). And as long as customers are creating cards, what about allowing them to share their card designs with the rest of the game's community? With publisher approvals, the customer-created card designs can go live for sale to other customers, as either official or unofficial cards. Those cards are then available to the rest of the community to rate and purchase. As the publisher, you can even elect to allow that customer-designer to get a royalty share when their design sells. Card games in the future won't just be funded by the crowd, they can be extended and marketed virally on into the future. A card game can actually be created by a community, with constituent members having multiple incentives to spread the word about the cards they contributed. Like perfect snowflakes, every card ever printed for the game is unique from every other card ever printed. Based on algorithms for text and graphic assets a designer supplies, we will be able to create card images on the fly when ordered by a customer. Those uniquely generated cards are then printed and shipped to the customer. Forget the surprise factor of what rare card was in your Magic booster pack - now the surprise is what totally unique card combination did I get on the cards I ordered? The foundation of the revolution lies in the ability to print just one card and put whatever content or context you want on that card, and the same for the very next card, and so on. Nearly everything that has been static about the design of card games is now going to be dynamic. The longer you think about that, the more far-reaching you'll see its impact becomes regarding the way card games can be designed and published. Basic things like having decks with a dynamic, not static, number of cards in the deck is already possible now on DriveThruCards. We are currently building out a modular tool set that will make the rest of these concepts possible. Realistically, coding it all will take some months before the first tools are ready for use, and then some years to develop the full tool set (though really the development of the tools will never stop). Our goal, as always with our marketplaces, is to build out a lot of tools, put them in the hands of publishers and designers, and then follow where you lead. The 1,200+ creative, entrepreneurial designers who work with us consistently have great ideas for designing and marketing their titles, ideas that force us to expand the use of our marketplace tools in ways we never foresaw. I have no doubt the same will be true of the tools we build for cards. Deploying these card tools will require perhaps a closer degree of cooperation with publishers than ever before because our development team will have to take the modular tool set we develop and snap the right pieces together for a given need on a given card product line. Right now, we are letting publishers know what's coming. We're happy to talk about any existing or future card titles you have that would benefit from any of these possibilities. It also simply takes time to realize when invisible shackles have been removed. I love the anecdotes that are metaphors for this: Things like chickens raised in enclosed chicken houses until one day a door is opened and they are allowed to "free range" outside. The chickens are too scared of that bright alien world outside the open door to venture out of their accustomed environment. Similarly, the idea of letting a game's community take over the design of new cards will seem alien to many publishers, at least until some pioneer marches boldly out into the daylight, engages their community in a viral community design and purchase loop, and reaps the rewards of doing so. I encourage you to give us your thoughts on these plans. What could ideas like this bring to your card products? Assessing which of these tools and features should roll out first is something we're discussing internally already, but this is an opportunity for publishers with card products to give us their wishlist of features for their games.